Hello everyone! 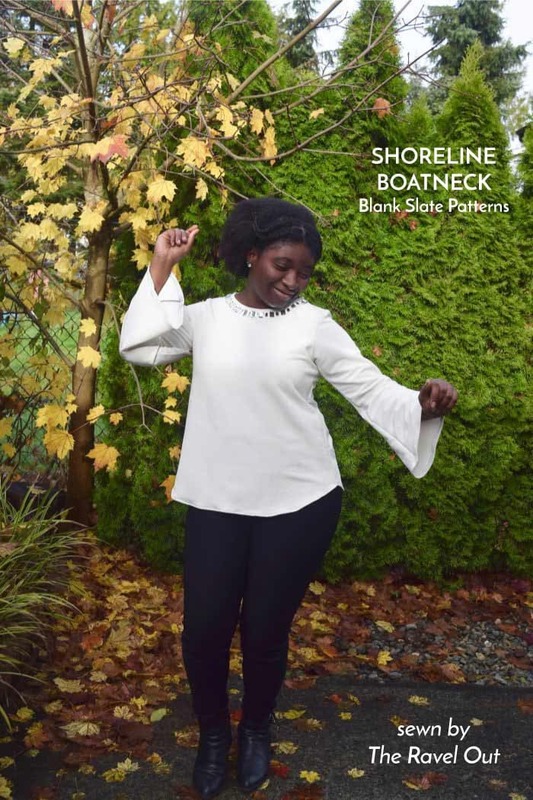 I am Sylvia of The Ravel Out and I am excited to share some new hacks using the very loved Shoreline Boatneck pattern. 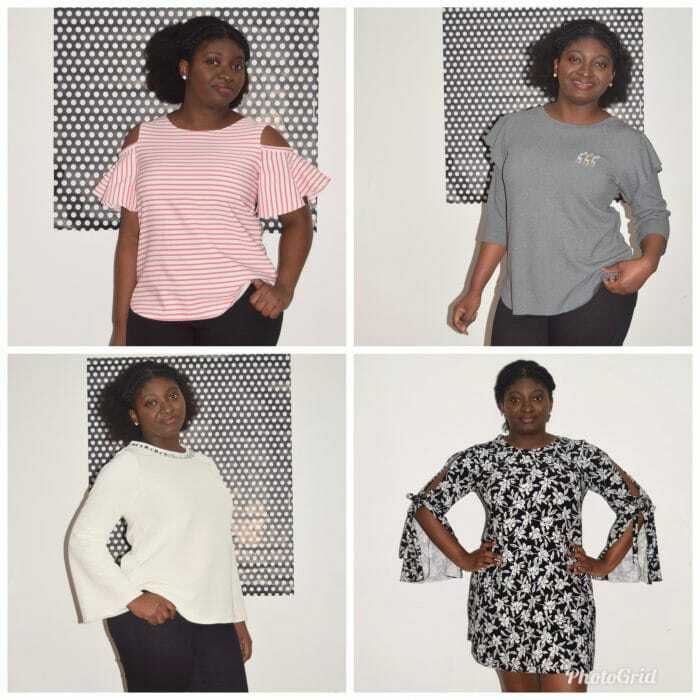 (aff link) This year has been the ‘year of the sleeve’ and so I decided to focus mainly on sleeves in this project. I also added some sewing add-ons in light of the upcoming holidays. Shoreline is an easy sew and there are endless variations that can be made to it. So why make one hack when you can make four, right? This is such a versatile pattern and works great with both knit and woven fabrics. I made three of the versions with knit fabrics and one woven fabric. 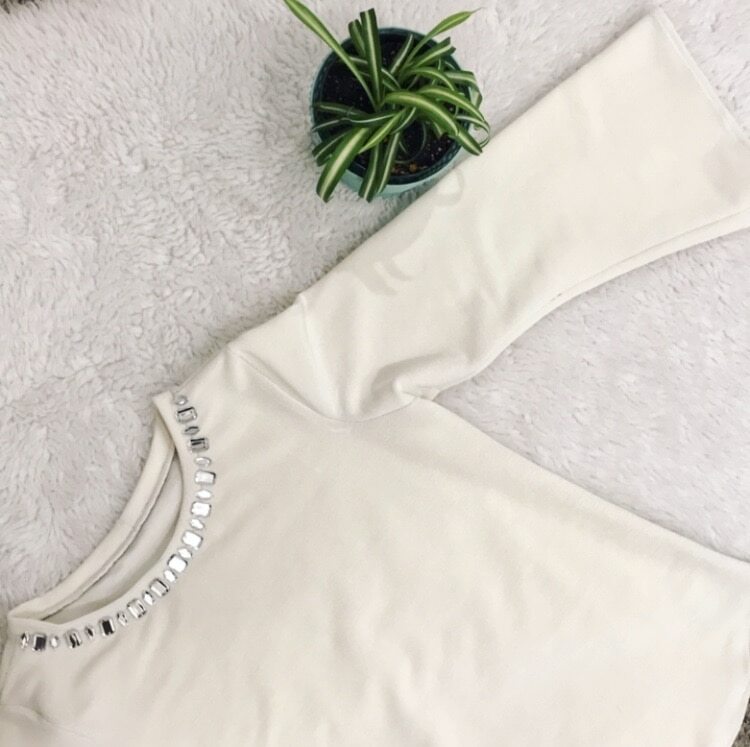 For the first variation, I hacked the sleeve into a bell sleeve and added gem accents to the neckline to give the casual look a little more sophistication. I used a white heavyweight knit from my pattern stash and made a neckband instead of the neck facings that come with the pattern. 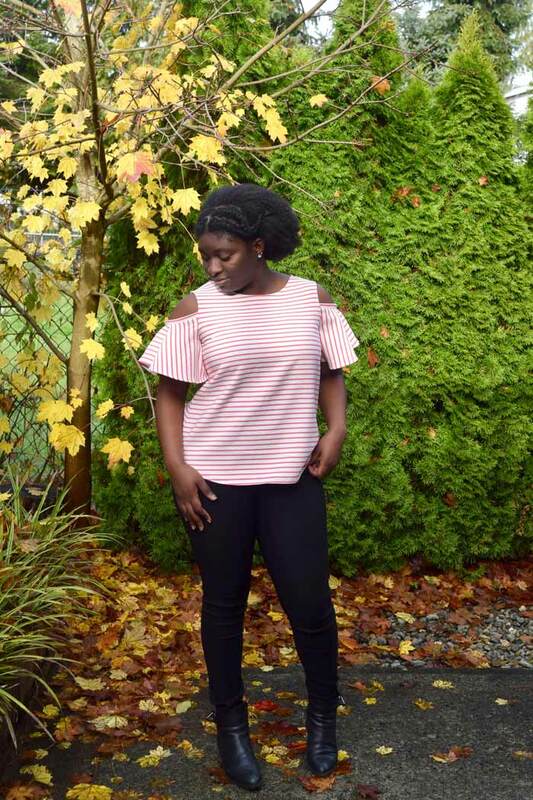 The second variation is a cold shoulder top using striped salmon striped woven fabric. For the neckline, i simply serged, turned it to the inside, and topstitched. 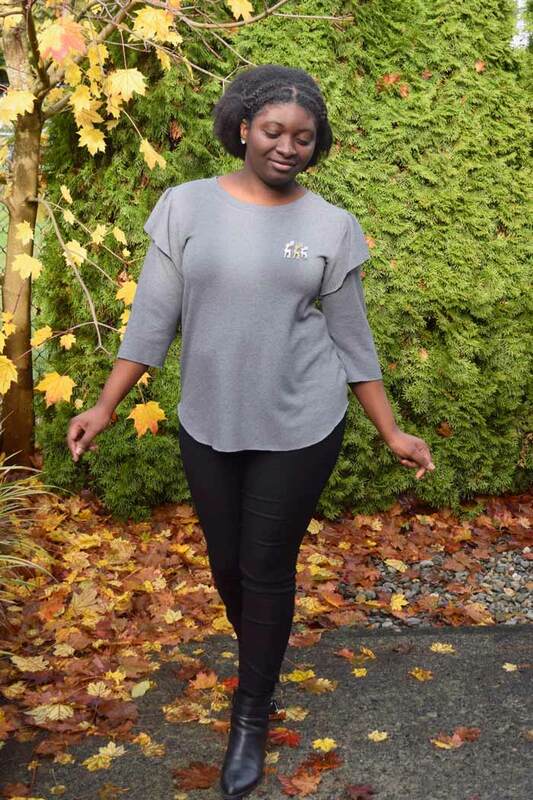 For the third variation, I made a ruffle sleeve with a neckband using this soft, grey knit. I used the 3/4 sleeve length and added a ruffle to the sleeve. This ruffle actually did not come out as pronounced as I wanted it to. Nevertheless, I love it. I added the silver and gold reindeer add-ons to give a little holiday feel. This is definitely one of my go-t0 tops for the upcoming holiday season. Finally, I made a dress version and hacked the sleeve into a split sleeve with ties at the elbow. 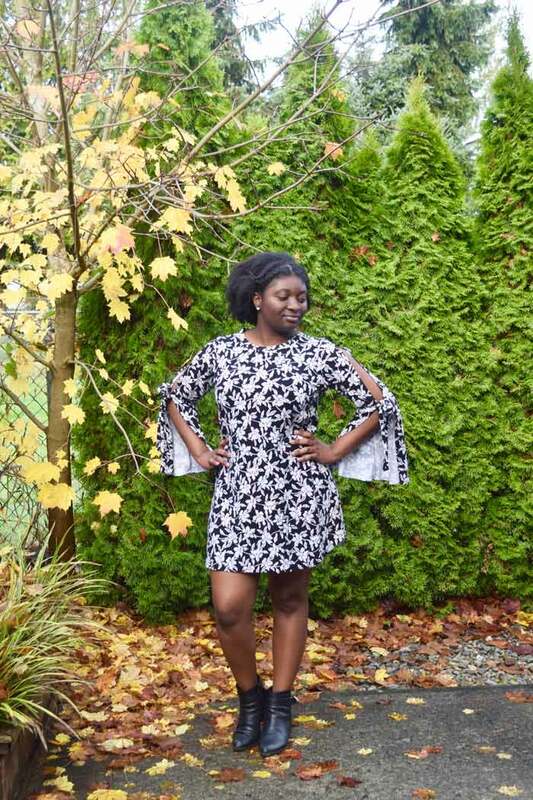 I used the bell sleeve shape from my first variation to give it more flair. Oh how I love these sleeves! As you can tell, there are endless variations using this simple pattern. I love this pattern because it is such a great fabric stash buster as well. 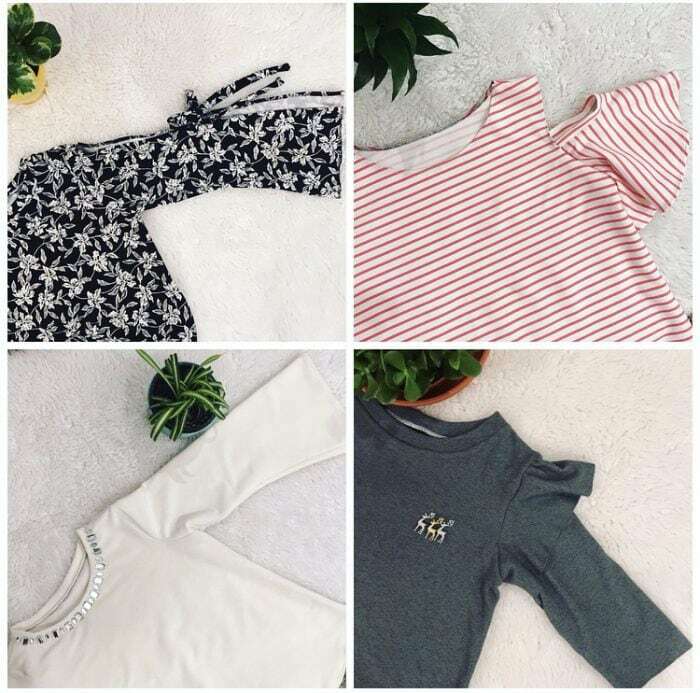 Have you hacked the Shoreline Boatneck (affiliate link) or do you plan to? I hope you love my spin on this pattern.